Improve your declarer play. Make the most of the entries between declarer and the dummy, even some hiding in full view! An entry is usually considered a high card to give declarer the chance to get to the dummy or to declarer’s hand. Yet an entry from one hand to the other has two parts. There is the winner in the hand you are trying to reach. Equally important is the lower-ranking Link Card that provides the transportation to the entry. Think of Entry as L’Entry as a reminder of the importance of the link card. 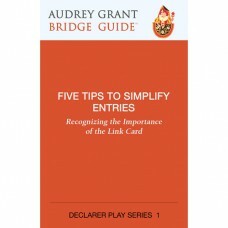 The Five Tips to Simplify Entries are intriguing, simple, and practical. You’ll be in charge of knowing how to improve your declarer play. Essential ideas are summarized on the Bookmark for easy reference. The ABC’s of Declarer’s Plan. When declarer makes a habit of using Declarer’s Plan, declarer knows what’s going on in the deal before playing to the first trick. A summary of the Five Tips to Overcome Entry Problems. The Probability of Suit Distributions in the Defenders’ Hands is included on the inside back cover as a guide when planning the play. The basics and finer points of entries are introduced through sixteen carefully-selected instructional deals. The first deal is straightforward yet complete with the basic ideas about handling entries. The last two deals were played by famous players, illustrating how the best players of all time handle complex entry situations. By the time you get to Deals 15 and 16, we’re confident you’ll be in a position to appreciate the art of the entry. The deals are presented in a quiz format. The suggested bidding, opening lead, and the first step in planning the play are given. You decide the order that you should play the cards to make the contract. Turn the page to see the recommended play with an explanation. The conclusion on this side reviews declarer’s plan and tips for overcoming entry problems. We hope you enjoy your experience with entries.